American students completed an eight-week intensive Korean language program operated by CNU Language Education Center. 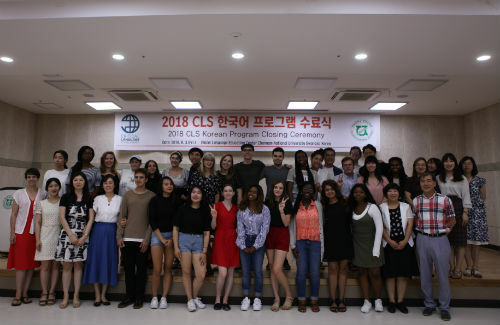 26 students selected for a Critical Language Scholarship (CLS) program supported by the U.S. government took Korean lectures for four hours during weekdays from June 9 to August 3. During eight weeks of studying Korean language, they had strong restrictions about using other languages and also took part in cultural classes twice a week, outdoor excursions and cultural experiences. Dr. Megan Beard, Resident Director, said, “With this program, students have opportunities of cultural understanding through activities like K-pop dancing class, taekwondo and traditional crafts classes. Moreover, each student was put into homestay with Korean families from the local community.” Drew Limpasnven, one of the CLS student, said, “The main purpose of coming here is learning Korean language in a Korean speaking atmosphere. I need to learn Korean because of my master’s degree. I am planning to create a Korean-English and English-Korean translator App.” CNU has been designated as the only institution which is responsible for the CLS Korean program for the fourth time in a row since 2015.